Trying to communicate an issue or problem with a web application over the phone can be a trying experience for both the consumer and the IT support rep. If a user isn’t tech-savvy, it can be difficult to explain to a customer support rep the exact origin of the issue. Remote connectivity technologies, which allow support reps to log-on to a customers computer remotely, can be very helpful is trying to solve a web or computer problem. Help-desk startup Zendesk has partnered with LogMeIn, a provider of SaaS-based, remote-connectivity technology, to bring remote support to Zendesk’s software. Zendesk essentially offers a Web-based help desk online ticketing system for customer support. The partnership gives IT help desks and support staff the ability to launch remote support sessions with LogMeIn’s technology directly from a Zendesk ticketing interface. 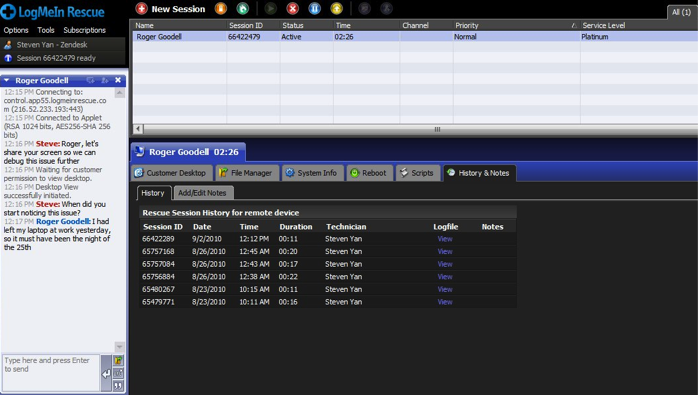 Support technicians can collaborate with their customers in real time to quickly diagnose and resolve issues related to their products by viewing and controlling a user’s computer or smartphone. And reps can input ticket details from the LogMeIn sessions directly into the Zendesk tickets, including timestamps, chat logs, notes, as well as any custom fields and survey answers. Zendesk, which just crossed the 5,000 customers milestone, recently added additional functionality to its support platform with a deep Twitter integration.